Lebanese Food was always one of the country's principal attractions and it has now largely passed the borders to become extremely popular in the West. 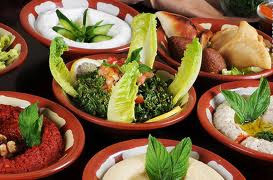 Lebanese cuisine is mostly based on cereals, vegetables and meat. Most often foods are either grilled or baked in olive oil; butter or cream is rarely used other than in a few desserts. Vegetables are often eaten raw or pickled as well as cooked. Herbs and spices are used and the freshness of ingredients is important. Like most Mediterranean countries, much of what the Lebanese eat is dictated by the seasons. 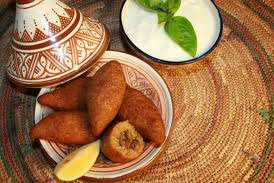 The Lebanese cook always prepares several dishes in advance and stores the basic mixtures so that they can be combined with other food items to quickly make a large variety of food named mezza. Mezza consists of small savoury dishes, such as dips, salads, and pastries. 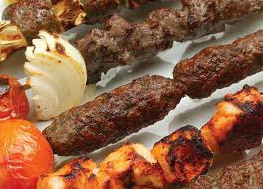 The mezza are typically followed by a selection of grilled meat or fish. In general, meals are finished with Arabic coffee and fresh fruit, though sometimes a selection of traditional sweets will be offered as well. Mutabbal or Baba-ghanouj: aubergine mashed and mixed with seasonings or tahineh. Falafel: a deep-fried ball or patty made from ground chickpeas, fava beans, or both. Kafta - cigar shaped meat balls consisting of ground lamb, mashed onions, spices. Waraq enab or Grape vine leaves, stuffed with rice, chopped mint, lemon juice, pepper, minced lamb. Shanklish - cow's milk or sheep's milk cheeses with thyme. 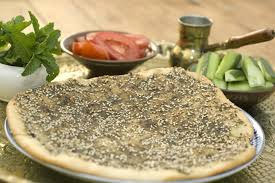 Manaeesh or the Lebanese style pies: Mini pies (usually folded) that are made in any number of local bakeries or Furns, traditionally garnished with cheese, Za'atar (thyme), spicy diced tomatoes, kashk in its Lebanese version, or minced meat and onions. Breakfast, lunch and dinner. Family cuisine offers also a range of dishes, such as stews or yakhnehs (yakhnet batata, Kousa bi Laban, Kousa mahshi, msa'aa, kebbeh bi laban ans others) which can be cooked in many forms depending on the ingredients used and are usually served with meat and rice vermicelli. The national beverage is arak, a strong anise-flavored liquor made from fermented grape juice. It is usually drunk with water and ice, which turns the clear liquid milky-white, and usually accompanies food. Arak is a strong spirit similar to the Greek ouzo and the Turkish raki. Lebanon is considered one of the cradles of wine production, dating as far back as 5000 years with the ancient Phoenicians. Through the ancient port city of Byblos, the wine was traded with Greece, Spain, Italy (Rome), and Carthage in northern Africa, and fared well in these exchanges for gold and other precious goods. Over the centuries the seeds planted in far off soils and evolving techniques from these wine trades and vineyard establishments laid the foundation for modern wine-making. Also the French mandate influence on the country is apparent in the grape varieties and the most commonly planted types are: Cinsaut, Carignan, Cabernet Sauvignon, Merlot, Mourvedre, Grenache and Syrah. 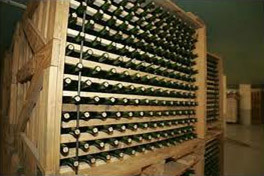 Major vineyards produce the bulk of Lebanese wine exports, located in the Bekaa Valley: Kefraya, Ksara, Domaine Wardy, Massaya and Chateau Musar is located in Ghazir (Mount Lebanon). All vineyards are open to visitors and tasting tour is part of the visit. Dabke is a collective dance performed in an arc and limited by the space. Consist on thumping the floor hard with their feet. Historically the D abke is a dance performed by different inhabitants of the mountains lying above the Mediterranean coastline and the Tigris River. Therefore it is a dance only typical of the villages and towns of Lebanon, Syria, Palestine, Jordan, and Iraq. The eminent musician Zaki Nassif reckons that the origin of Dabke goes back to the days when the people of the village gathered for the "aouna" or "aouni"or the mutual aid. Old Lebanese houses were built from stone with a roof made of wood, straw and dirt. The dirt roof had to be compacted which required stomping the dirt hard in a uniform way to compact it evenly. This event of cooperation is called ta'awon and from here comes the word awneh, meaning "help." This developed into the song Ala Dalouna (على دلعونا), or roughly translated "Let's go and help". Since the founding of the Baalbeck Festival in 1957, Lebanese musicians, notably the Rahbany brothers, Zaki Nassif, and Afif Radwan, included Dabke in their musicals and operettas. They worked hard on enhancing it and succeeding in presenting it as a worthy classical art. And it is not limited to festivals or events but fills an important place at the heart of all Lebanese occasions, festivities and weddings. 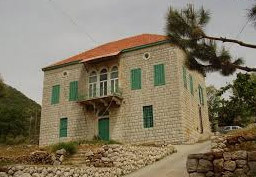 The most common form of the Lebanese house, however, is the central hall house. This simple cube with its red tiled roof is a later development of the Lebanese house. Usually consisting of two floors, the lower floor is vaulted and is used for storage while the upper floor contained the living area. As its name indicates, the plan of this type of house consists of a central space surrounded by several rooms. The central hall called Dar, is the heart of the house that serves as a multipurpose room for family and friends. With the entrance at the back, the house addresses itself to the valley and views. Nature is here celebrated through the elegant triple arch that opens out the hall through its full height to the view. The triple arch has a central door with a window on each side and a small balcony outside it. The orientation of the main space towards the valley and hence the breeze, the high ceilings and the placement of windows and doors ensured excellent cross ventilation. This created a comfortable cool environment even in the midst of summer. The red tiled roof, probably an Italian import, appeared in the nineteenth century. Never used as a living space, the roof has no windows nor chimney stacks. Known locally as the Tarboush or fez of the house, the red roof was a source of pride for its owners. The simplicity of the stonework and the lack of decorative friezes is a testimony to the skill of the masons. Their work was of such perfection that joints and connections did not need to be hidden or masked by decorative bands. Windows were simply articulated in the facade by a simple projecting frame to set them off against the wall surface. Decoration found in the ironwork or plaster work was inspired by nature. Abstract floral or leaf motifs were repeated in different houses adding to the harmony of the architecture and landscape. 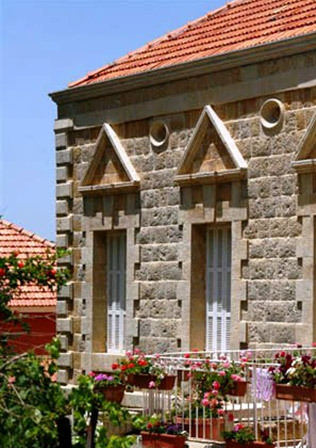 The beauty of the traditional Lebanese house is in its simplicity and modesty. It blends into its surroundings through the use of natural materials and its acknowledgment of nature. Always a source of pride for its owners, it never dominated the landscape nor was it ostentatious. In all its different forms and styles, it always embraced and celebrated nature.